IRGC Qods Force Commander Major General Qassem Soleimani inspecting Iraqi Harakat al Nujaba position in southern Aleppo countryside, September 6. 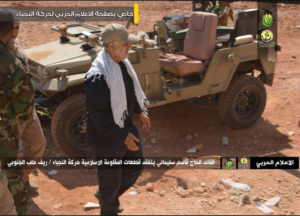 Photos have emerged claiming that Major General Qassem Soleimani, the commander of the Islamic Revolutionary Guard Corps’ (IRGC) elite foreign operations unit, the Qods Force, is in Aleppo, Syria. Soleimani leads Iranian strategy in Syria in coordination with both Russia and Bashar al-Assad’s government. He commands the IRGC-led Shiite expeditionary force there, which includes the Afghan Fatemiyoun, Pakistani Zeynabiyoun, Lebanese Hezbollah, and the Iraqi Harakat al Nujaba. 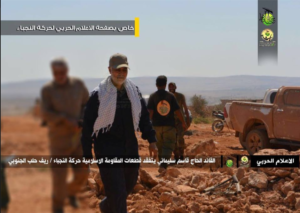 Nujaba, which is now the largest Iraqi Shiite contingency in Syria, posted on September 6 photos of Soleimani inspecting positions in southern Aleppo. The commander “reviewed the strategic points of the siege of terrorists” in Aleppo and “made some notes to field commanders,” according to Nujaba’s Telegram post. Soleimani also reportedly met with the chief commander of the Syrian Arab Army (SAA) Tiger Forces on September 6, according to Al Masdar. 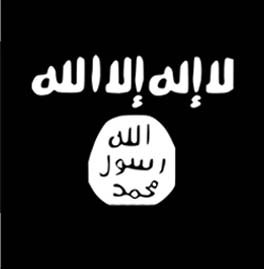 A military source told the outlet that the two commanders discussed upcoming offensive battle plans in Aleppo province. 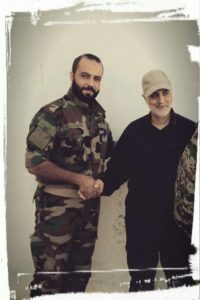 Qassem Soleimani with SAA Tiger Forces Commander Major General Duraid Abu Ammar, reportedly on September 6. Pro-regime forces aim to capitalize on their momentum and re-impose siege on the rebel-held part of Aleppo city. 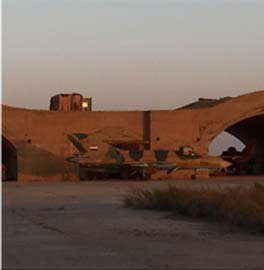 On September 4, after one month of costly operations, the pro-regime coalition, backed by intensified Russian airpower, succeeded in pushing back rebel forces from the Aleppo military base, an important access point to the city’s southwest. A photo circulating on social media that was flagged by observers suggests that Russian special forces may have assisted in this operation. Heavy clashes continue in Aleppo’s neighborhood of Ramouseh, also in the southwest. Pro-regime forces have blocked the Alramousa road, the last supply route into the rebel-held part of the city that was opened one month ago. 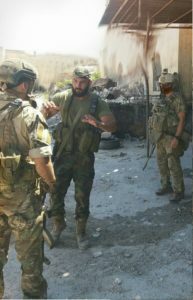 Photo circulating on social media allegedly showing Russian special forces in Aleppo military base, September 3. Last month, forces from the jihadist-led Jaysh al Fath (JAF) and Fatah Halab coalitions launched a major offensive to break the regime’s siege, after pro-regime forces in late July had completed Aleppo’s encircling. 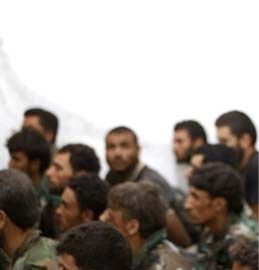 After rebels broke through the defenses of pro-regime forces, primarily SAA, in the southwest, the IRGC announced the deployment of 2,000 Lebanese Hezbollah and Iraqi Nujaba combatants to Aleppo in order to bolster pro-regime positions and regain lost territory. A Nujaba spokesman has said that the group has sent an additional 1,000 fighters since September 5 to further reinforce positions in Aleppo, according to Al Jazeera. The pro-regime coalition has simultaneously expanded its assaults to the southern areas of Aleppo to eliminate the threat that the opposition poses to the regime’s siege of the city. 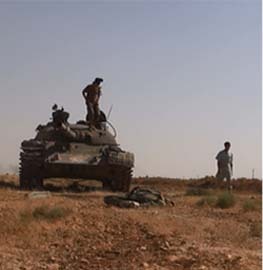 Immediately following this week’s success on the outskirts of Aleppo, Hezbollah, Shiite militias, Liwa al Qods (pro-government Palestinian militia), and SAA launched on September 5 an offensive on JAF positions near the village of Khan Touman, about 15 kilometers southwest of Aleppo. 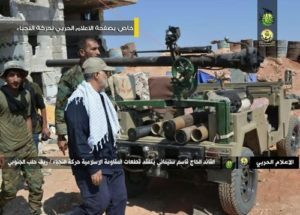 On September 6, a Nujaba field commander reportedly told IRGC-affiliated Fars News Agency that the Iraqi militia had poured all of its forces in Syria into the Aleppo fronts, and that it had made inroads into Khan Touman a day earlier. The IRGC has vowed to retake Khan Touman after losing it in May. The IRGC and its militias may push into northern Idlib province, the opposition’s stronghold. Nujaba head Akram al Kabi told Iranian media during a visit to Iran last week that Nujaba was preparing operations to break the siege of the Shiite villages of Fua and Kufriya, the last remaining pro-government areas in northern Idlib that are located to the northeast and close to the borders of Aleppo province. Supreme Leader Ali Khamenei has issued an order to lift the siege of the villages, according to Kabi. The majority of Iranian casualties since July have been active duty and retired officers. In late August and the first week of September, at least five IRGC commanders with the rank of brigadier general were killed in Syria. Four were reportedly retired officers prior to Syria. All but one was killed in Aleppo: a Guard commander died in the province of Hama in western Syria during a rebel offensive. All were veterans of the Iran-Iraq War (1980 – 1988). Guard officers take pride in fighting at the front lines; their ethos values martyrdom in battle as the highest honor. This also means that they often expose themselves to enemy fire. 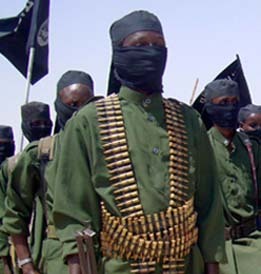 Snipers in particular can target grey-haired and middle-aged fighters at the front. At least one IRGC commander killed last week was confirmed shot in the head by sniper fire. Although these commanders were valuable assets, there are more ready to take their places. Diplomatic talks continue between major powers for ceasefire and potential settlement in Syria. The pro-regime alliance’s objective in Aleppo, meanwhile, is to render impossible the prospect of opposition forces interfering with the siege of eastern Aleppo city, an operation that has been underway since the Russian intervention and Iranian escalation in September 2015. Sieges are arduous and long, and adversely affect civilian populations. Defeating the Sunni jihadists, Islamists, and other rebels in Aleppo is nevertheless the cornerstone of the pro-regime alliance’s strategy in Syria, and it would be a significant victory that could be translated into leverage for a political settlement. 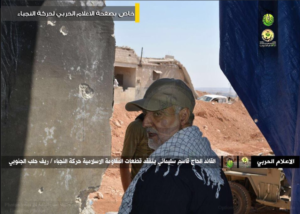 Qassem Soleimani inspecting Harakat Nujaba position in southern Aleppo, as posed on September 6. Maybe the Iranians can cleanup the mess created by our so called allies that’s causing havoc all over the world. We’ll see won’t we? Can you imagine a US general with the cojones to fight up this close? We are so risk averse w senior leadership that they rarely see danger after making major. One of the 6,436 reasons we lose every war we fight. Risk aversion, overreliance on technology, lack of local understanding would be my top three. If Soleimani was the Patton he is often made out to be, the rebels would have been crushed years ago. Meanwhile, the stalemate continues. At the Battle of the Bulge, Gen. Patton’s Third Army performed admirably. When the Jihadis counterattacked in SW Aleppo just recently, Gen. Soleimani applied almost exactly the same battle plan as Patton with the same flanking maneuver. Plus, Soleimani applied his reserves to effect a cut-off that trapped the whole of Jaysh al Fath and Fatah Halab main forces. A+ for both of them. Third Army was all but exhausted after the drive on Bastogne and unable to go for a cut-off. Patton was also surprised to find Bastogne defended by mixed race ad hoc units. Patton had a Black tank unit, but seeing mixed units doing infantry tasks was unique for the day. For Gen. Soleimani the lessons of history (including 12/1944-1/1945) are apparent in his response to what was a large scale counterattack. A warning to Erdogan, China and India support Assad openly, Soleimani is Professional Riyad Hijab is not. 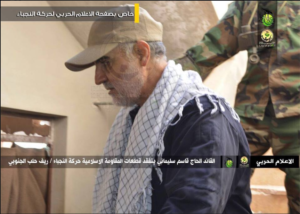 Not surprising to see Soleimani so involved in Aleppo. 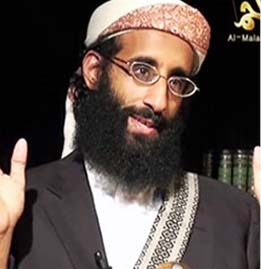 His appeal to Putin & his concern that Assad & Iran would lose control to jihardis from IS & rebel groups may have narrowly averted the fall of Syria to Islamist extremists by involving Russia at the 13th hour. The loss of the Iran/Iraq veteran generals is testimony to the importance of this military struggle to Iran. They, and Soleimani, are of heroic status in Iran. Last time there was a cease fire a “rebel” surprise attack killed 50 Persian/Lebanese/Afghan SAA allies. Expect more of the same this time? Trm , Suleimani is fighting a trillion dollar war machine ex. The United States , Saudi Arabia , Britain, France , Germany , All the Gulf monarchies and Israel , with a military budget of 18 billion dollars. The fact that these men are in a stalemate against they’re enemies should open your eyes to the prowess, determination and superior military strategy this man has. General Patton would have been long gone if he was faced with these odds. Iran , Syria , Hezbollah and a few brigades of fighter’s from Iraq and Afghanistan. Dude be real here. On paper iran and hezbollah should have been finished off 30 years ago. You can fund a military but you cannot fund determination and steadfastness.